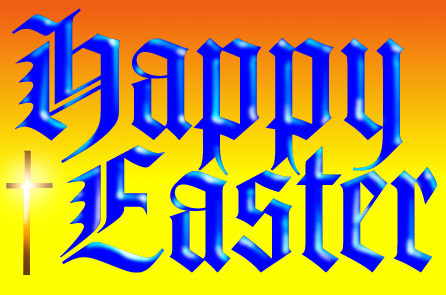 I hope that everyone had a wonderful Easter. My Easter weekend has been filled with singing. I sang for Good Friday service, a program yesterday, and for two services today which included sunrise service. I gave in this year and bought a new gold shirt and tie for Easter. I am not big on buying dress clothes, so it is usually a bit of a stretch for me. I knew I would find something at the store I went to, for they carried suits in every size and color, even the one’s you thought were unimaginable. I could not resist and tried on the suit coat for 7-button gold suit over my cargo shorts and t-shirt. I got a good laugh. I am sure I could have found some shoes to match the suit as well. Woo hoo!! Mom, don’t worry, I did not buy it. This entry was posted on Sunday, April 11th, 2004 at 7:33 pm. It is filed under Special Feature. You can follow any responses to this entry through the RSS 2.0 feed. What I wouldn’t give to see that suit on you. At least it wasn’t green gators like Don Magic Juan. LOL! I don’t think I ever saw a suit on you. We need pictures! Fess up! What! No pictures of the new clothes (and the gold suit coat)?! Call me old fashioned, but it’s nice to have something new for easter, even if it’s just socks.